Last week, the Yankees began a long stretch of games against teams that, at the time at least, had comparable records to theirs. 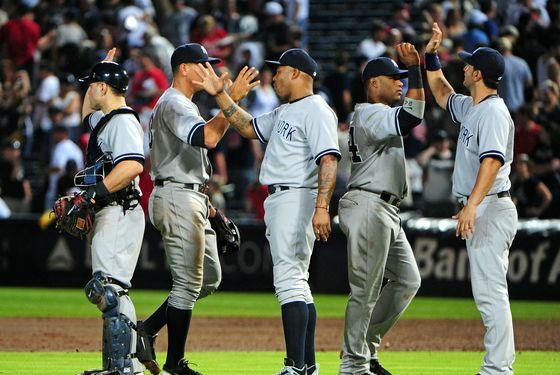 And so, if this is indeed a chance to learn something about the Yankees, what we've seen so far is awfully encouraging: Last night, the Yankees beat the Braves 3-2 in Atlanta to complete a three-game sweep. It's the Yankees' second straight series sweep, and they've now won nine out of ten and sixteen out of twenty. This surge has vaulted them to the top of the AL East standings — they're a game ahead of Baltimore and, thanks to R.A. Dickey, two games ahead of Tampa Bay — and their 37-25 record is the best in the American League. These are good times. Again last night, the go-ahead run came on a homer, this one hit by Curtis Granderson in the sixth inning, turning a 2-1 deficit into a 3-2 lead. But it's the Yankees' pitching that's been most encouraging of late: Over this current six game winning streak, the Yankees have gotten five quality starts from their pitchers, and that doesn't do justice to how strong a couple of those outings were. The bull pen has been stellar as well: Entering last night's game, it ranked second best in the American League with a 2.75 ERA. And last night — after Hiroki Kuroda threw six innings of two-run ball — three relievers combined to protect a one-run lead over the final three innings. The Braves struggled last night with runners in scoring position, but give credit to Boone Logan for getting out of a jam in the seventh and to Cody Eppley for getting out of one in the eighth. The Yankees won't win nine out of every ten games for the remainder of the year. But if their pitching staff — which, we'll remind you, entered the season with plenty of question marks that haven't entirely disappeared — can reproduce some more stretches like this, especially with a lineup that should score plenty of runs, the Yankees will be in good shape. The bull pen even has some help on the way: David Robertson will be activated tomorrow, at which point he'll again become the eighth-inning man (for the time being, at least), setting up for Rafael Soriano. Next up for the Yankees are the Nationals, a team currently riding a six-game winning streak of their own and one of only two teams in the big leagues with a better record than theirs. They begin a three-game series in Washington tomorrow night.